Hogs and Heifer's is a well-known watering hole. The bar is found on 3rd Street a block and 1/2 north of Fremont Street. Should you have the time it is definitely well worthy of a visit. 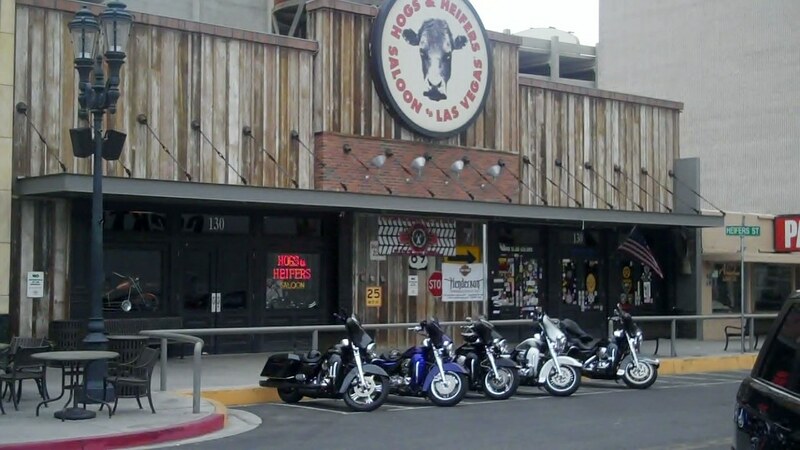 Hogs and Heifers is the center point of a wide range of the activities connected with motorcycle enthusiast and attracts visitor coming from all around the globe. As Biker Bars go this is a excellent example. The music which seems to continually be played is either country western or southern rock. There's a rumour that the "girl bartender dancing on the Bar" thing began at Hogs and Heifers. There are a couple of pool tables, however the primary activity is drinking. From a visual point of view the interior decor tend to reflect the rebel image associated with some motorcycle riders. While looking around I noticed an area of the wall dedicated to Elvis. Also I understand that there's yet another one of these bars in the New York City area. When I went to the bar I only had a video camera and the security guard informed me that videos weren't permitted. A still camera could be used but only pointed at the bar area. Once again absolutely a sight to see.